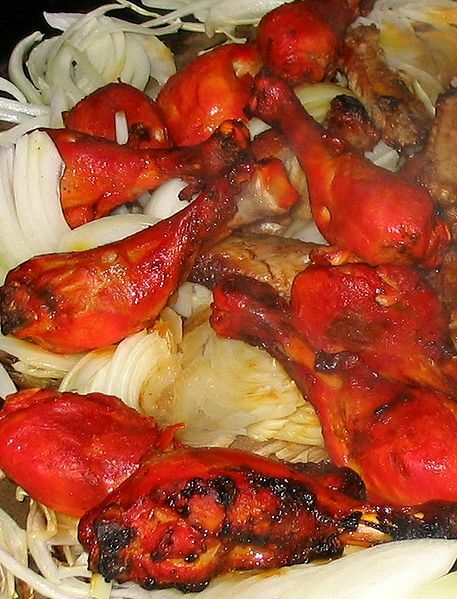 Chicken Tandoori is a roasted Indian chicken delicacy. The chicken is marinated in yogurt and seasoned with tandoori masala. It is moderately hot, but the heat is toned down to a mild taste level in most Western nations. Cayenne pepper, red chili powder or usually kashmiri red chilli powder is used to give it a fiery red hue. A higher amount of Turmeric produces an orange colour. In some modern versions, both red and yellow food colourings are used. Left: Tandoori chicken with onion. Tandoori masala, used as a seasoning, is a mixture of spices specifically for use with a tandoor, or clay oven. The specific spices typically include garam masala, garlic, ginger, cumin, cayenne pepper, and other spices and additives. The spices are often ground together with a pestle and mortar. Chicken Tandoori is traditionally cooked at high temperatures in a clay oven (tandoor), but can also be prepared on a traditional grill. The tandoors are bell-shaped ovens, set into the earth and fired with wood or charcoal reaching temperatures of about 900 degrees. Chickens cooked in these ovens are tender and succulent inside and crispy outside. The popularity of Tandoori Chicken led to many derivatives like Chicken Tikka (and eventually the Indian dish popularized in Britain Chicken Tikka Masala), commonly found in menus in Indian restaurants all over the world.